Running the Nets: Upstalk review | Action Points! We kick off the Lunar cycle with a stellar new pack (hur, hur) serving up a whopping two new identities and a few potential game-changers. Let’s strap a rocket to this thing (does that even make sense?) and dive right in. So I really like this for many reasons, but oddly other internet denizens don’t seem to be as excited about it. 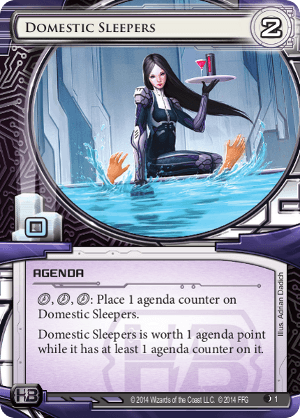 It’s a completely risk-free agenda balanced out by the need to spend a whole turn “activating” it (and man, that flavor…) and the fact that it doesn’t contribute to your deck’s required agenda point count, so it will be going on top of your regular agenda set. Regardless, it’s pretty much an auto-include in every HB fast-advance deck, which was already a formidable archetype, and I’d strongly consider it in every HB deck that isn’t trying to flatline the runner, which is every HB deck I’ve ever constructed. I don’t see the click cost being prohibitive at all since you don’t actually need to activate it until right at the end of the game, or if you want to go to game point. 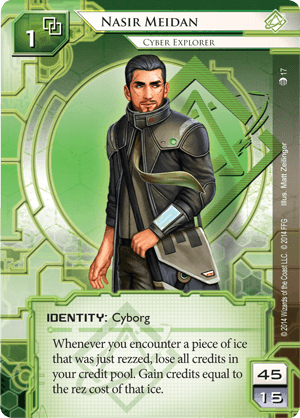 One more subtle effect of this card is that, along with Shi.Kyū from Honor and Profit, we might see “forfeit agenda” cards like Data Dealer really start to work for the runner, which I’m pretty excited for. This is the second piece of NEXT ice we’ve seen, and it’s already starting to look formidable. So with 6 pieces of NEXT ice in your deck you can probably rely on getting at least 3 of them out over the course of the game, and that starts to make them seriously taxing. Cheap, run-ending ice that ramps up over time – what’s not to love? They’re definitely worth playing with already, and two data points isn’t much to extrapolate from, but since we’re all wondering what the presumed NEXT Gold will be like I’d expect a 4 cost, 2 strength sentry to round the trio out. This will have a serious impact on HB construction, which has traditionally suffered from not being able to reliably keep the runner out of servers, and hopefully we might see a move away from fast-advance back towards a more traditional win server. I’m not quite sure what to feel about this card. It’s a pretty blunt reaction to what some people might call a passing meta-problem, the dominance of Yog.0/Datasucker/Parasite, but it’s also an interesting new take on the standard end-the-run code gate that probably needs to exist in some form. At a cost of 5 I don’t think I’d put more than one of these in my deck at the moment (too much Emergency Shutdown fodder), but your milage may vary depending on your local meta. A runner running (run, runner!) Yog.0 will probably try to get around this with an AI breaker, so combine it with some AI hate like Swordsman or Wraparound to make your opponent flip the table. 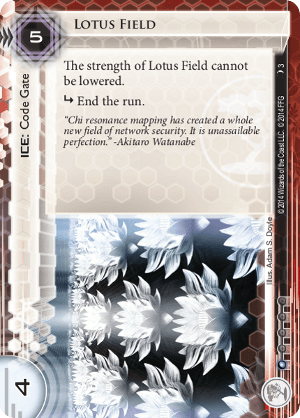 While this is obviously going to be used primarily to cheat out expensive obstacles like Wall of Thorns and Susanoo-no-Mikoto, it also lessens the sting of sacrificing a piece of ice in order to take down a hosted Caïssa program (Anarchs aren’t doing well out of this pack so far, are they? ), and is a great way to get some use out of your Quandary/Wraparound/Ice Wall/etc once the runner’s rig is up and running. 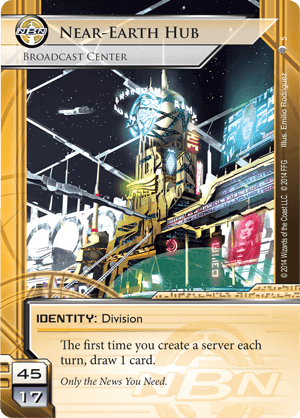 It’s also worth noting that, although there aren’t many ways to stack your R&D yet (little Netrunner pun for you there), those that are out seem to mostly be in Jinteki. 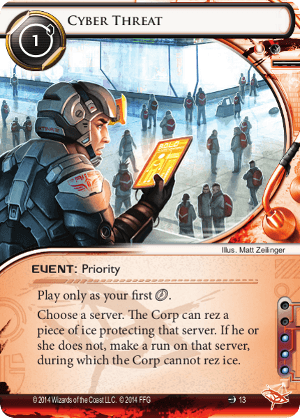 All that said, it’s a corp card that is neither economy, ice or an agenda, which means it’s competing for very limited slots. It’s an expensive splash, but watching someone mutate a Paper Wall into a Janus 1.0 or Wotan would make me very happy indeed, so if someone does manage to do that please tell me. So this is the best NBN identity out there at the moment, period. If you’ve ever felt yourself being pushed towards trace ice when you didn’t really want to this will definitely give you a bit more room for imagination. One problem I foresee is that a lot of people will be fooled into loving this identity because they understandably think that a fast-advance deck has to be, well, fast, when that’s not the case at all – in fact, I generally find myself flooding in my fast-advance deck more often than usual. It’s definitely a good choice for combo decks, with heaps of card draw and a bit more influence for any necessary splashes – look out for that inevitable card draw deck that uses this and Anonymous Tip and throws wild combos around everywhere like it’s MTG in the 1990’s. 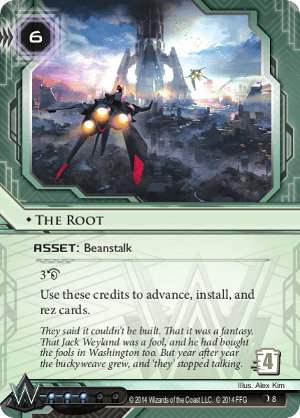 Pack your Whizzard and Imp decks, because we’re going to see a lot more asset economy. A solid little NBN card that makes them better at doing what they’re already doing. I think it stays in NBN, I have to say (in most other decks I’d rather just add more economy cards), but combined with the new identity I can definitely see this adding some new life into the NBN tag-n-bag game, since this pretty much always goes in a fresh server and doesn’t need to be rezzed until you’re ready to pull off your killer combo. Other than that, there’s not really much to say – it’ll go in the decks it needs to go in, and the others won’t even consider it. Oh, this is also the only way I can see myself using TMI in a deck, so that’s a thing. 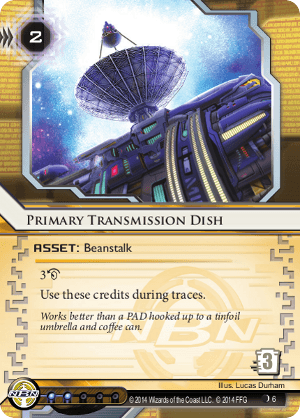 I have to say, I’m really glad that they made this card so expensive to splash, because NBN is the only corp that I’m happy to see this go to. A great choice for R&D and HQ, it’s easy to get excited over this until you realise that pretty much every NBN ice has only one subroutine, and even the neutrals only occasionally have 2. 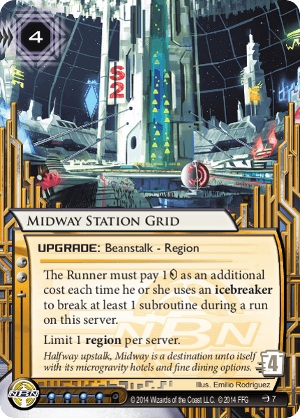 It could definitely be fun to use to ruin a runner’s math, since you get to rez this after the runner decides not to jack out, but for best effect you’re going to want to combine this with borrowed ice with multiple subroutines. Breakers that break multiple subroutines with a single action will plough through this, but I don’t know if that will be enough to make people start running them when they weren’t already (though this and NEXT Silver do make Morning Star look pretty nice…). 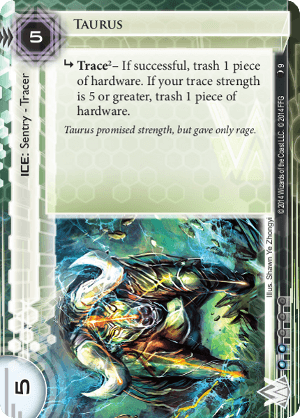 A nice tool for Weyland glacier decks, assuming you can protect it. If you only rez it when you need to, it’ll only end up costing 3 credits, and with a trash cost of 4 that does work out in the corp’s favor even if the runner gets to it straight away. The real question is how you go about protecting it, since you can pretty much guarantee the runner’s going to want to get rid of this as soon as they can. The true potential of this card will be as protection against induced bankruptcy (Account Siphon, Vamp), and for that alone I love it. Imagine the look on the runner’s face as you rez this during their siphon run. It makes me happy. Get ready to welcome back Weyland tag-n-bag to your local meta. When I first looked at this card, I have to say my thoughts first went to console destruction, but it wasn’t long before its true purpose hit me – remove one, or maybe even two Plascrete Carapaces in one fell swoop! 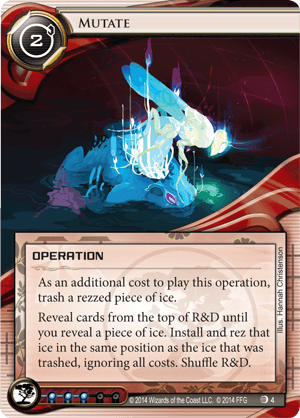 This is the second piece of ice that provides hardware destruction (Flare being the other), but at only 5 cost and with at least one piece of destruction practically guaranteed, I expect to see this in pretty much every meat damage deck. Other than that, it’s a fun one-of in a lot of decks that is guaranteed to get a reaction from your opponent. I’m definitely going to have to re-evaluate the way I run, because I tend to be quick to trash duplicated of my installed consoles etc. when I’m digging for something, but this makes that a good way to shoot yourself in the foot. Really, really strong. 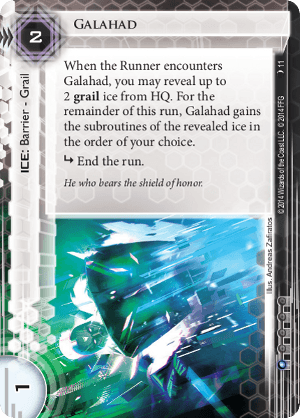 There are two main uses for this: a) as early-game ice that, although a little expensive, remains unbreakable except via some AI breakers and b) to help boost NEXT and the upcoming grail ice (text isn’t active in the hand, so it can’t be used to help grail ice unfortunately). But even in the mid-late game, this will still remain taxing. An interesting downside downside is that it can also be a destroyer, AP or tracer to be targeted by the specialised subtype breakers. If you’re running Bastion, then you should probably replace at least one copy of that with this. 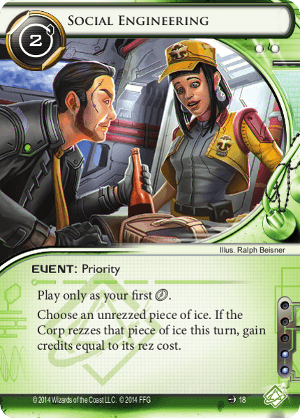 A new spin on ice that rewards the corp for keeping cards in HQ rather than installed, it’s hard to evaluate this without knowing more about what’s planned for the set. One thing that is obvious to me is that you need to really make these guys a central component of your deck in order to get the most out of them, rather than just tacking them on at the end (a bit like the NEXT ice). We have an official leak for 3 other Grail ice pieces, and they do look like they’re gonna be pretty lethal, but there isn’t much to say until we get our hands on more of these. Some more neutral tag punishment (after Freelancer and Private Security Force) is always nice to see, but my guess is that you’ll usually see this in NBN. 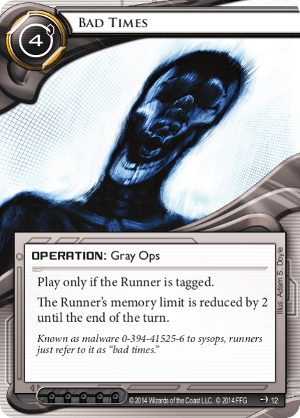 Weyland tag-n-bag decks would love to have more punishment that slows the runner down, but without a reliable way to tag the runner they’ll probably save their SEA Sources for Scorched Earth. This will probably have the biggest effect on Anarch and Criminal tag-me decks, so expect to see them floating a bit more memory from now on, or else slowing down a bit to clear tags. A card with great intentions, but perhaps not the best execution. I’d be glad to be proven wrong, but the effects are not as great as they first might seem – primarily, the corp gets to choose what ice is to be rezzed, which means that if you want to use this to skip a whole server with several unrezzed ice on it, the corp can just rez the cheapest one they like, which probably won’t give you the information you were looking for. The best use of this is early game, when servers may not have more than one or two pieces of ice on them and you need to know what type of breaker to go searching for. Does it compare to Forged Activation Orders? Well, maybe if you’re in anarch and don’t want to spend the influence, or are Reina, but otherwise the FOE is much better in my view. Leaked some time ago, this has had people talking for a while, probably because the ability to take money from the corp has proved to be very powerful. 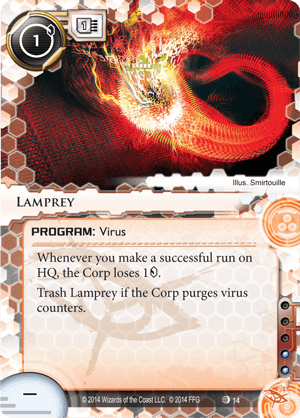 It’s definitely a good card for virus-light criminals, but I’m not sure I’d put it in any anarch decks with the possible exception of Noise, who loves 1-cost viruses. It’d be a nice trick to pull if you’re planning a series of HQ runs anyway – maybe you’re splashing Sneakdoor Beta, who knows – with the expectation that it’ll get purged the next turn, but really, this is a criminal card in all but name. Serving suggestion: combine 3x with Mass Install and go on a crazy stealing spree. This is probably the card in the set that gets me least excited. Being a priority event means you essentially have to be playing a tag-me style with a reason to suddenly reverse direction for this to be useful – maybe you tried syphoning and vamping the corp into bankruptcy, but now it looks like you’re not going to be able to keep them poor for much longer and you need to dump a whole heap of tags at once. If that’s something you see happening to you then by all means chuck it in, but otherwise it’s going to be a dead draw 90% of the time, and it already has to compete with quite a few criminal tag removal cards (Networking, Lawyer Up, etc). I would like to see the look on that NBN player’s face after you use this to remove 10 tags they just gave you with a Midseason Replacements, however (assuming they haven’t already comboed their way to victory). So for this to be better than just a link strength, you have to be encountering traces which you don’t need or want to spend money on, in which case you can pocket the credit. Does that happen to you often? It’s hard for me to say, and I’ll start keeping track of this in my games, but I have to say I don’t see this being played in competitive decks. Don’t get me wrong, this effect is absolutely better than link strength (unless you’re playing Underworld Contact), but then again I wouldn’t play a 2-cost link strength resource either. Maybe we’ll see something in the future, but for now, play Compromised Employee instead. This is my call for card of this pack that you’re least likely to actually see in the field. Finally we’ve reached my favourite card of the deck. I won’t lie, the moment I saw this guy I chucked together a deck with it, which is usually a good sign. He’s a super-aggressive runner, which is unusual for the Shapers, who runs down to the wire (hur, hur) and just manages to scrape through (hopefully). Expect a lot of fun and tense games, with plenty of face-checking and groan-worthy moments. There are some subtleties to keep in mind with Meidan, such as that increasing the rez cost of ice with Xanadu and Rook will result in more credits for you, and that there’s a timing window between ice being rezzed and you encountering that ice during which you can spend money on abilities, such as installing programs with Clone Chip, Self-Modifying Code or (my favourite) Personal Workshop. Your aim is to use these as a money sink to throw all your credits away before they get lost, so ideally you’ll be sitting on zero credits when you actually encounter the ice. You can also use this time to boost breakers that maintain their strength over the course of a run, such as Battering Ram, Gordian Blade and Pipeline. Lastly, recurring credits (such as those from The Toolbox) don’t get lost when you encounter recently-rezzed ice, so make judicious use of them to ensure you have enough money to see the run through, and remember to pop Katie Jones after the run to get a comfortable buffer again. I’ll probably write an article on my Nasir deck once I’ve fine-tuned it some more, but that’s the gist of it. 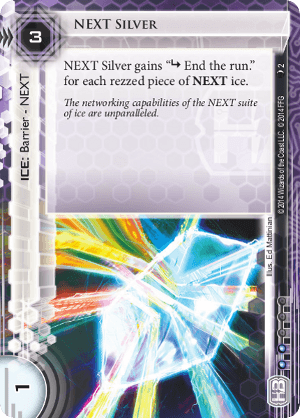 At first this sounds like it’s made to go with Nasier Meidan, but the subtle timing of both cards means you’ll end up losing credits gained to Meidan’s ability when you actually encounter the ice. This looks to me like it’ll work best in a Reina Roja deck, where you can increase the rez cost of ice to the point where it’s always profitable for you to use. For Shapers, you may want to consider it to ensure you have the credits to fetch what you need to run safely, but with a cost of 2 to use you’re probably better off replacing this with regular economy cards. An interesting new spin on memory management that will be going in precisely zero of my decks. This probably works best for a professor deck, or some other deck that always knows it’s going to want to install more and more programs, but the risks outweight the rewards for me. Firstly, in order to be getting the most out of this you’ll want to install two 2-memory programs on it, such as Magnum Opus and Battering Ram. In that instance you’ve managed to get 3 extra memory out of a single 2-cost card, which is pretty nice, but you’ve also opened yourself up to the most painful program destruction ever, so tread lightly. If you have Sacrificial Constructs or enough Clone Chips then all’s good, but that’s a lot of preparation needed just to squeeze a bit more memory out. 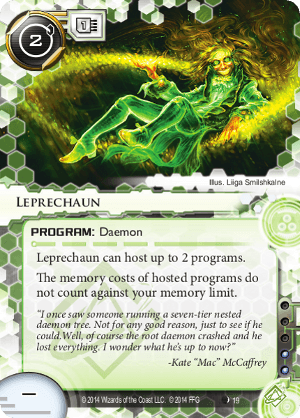 That said, there’s a silver lining in that Leprechaun is tutorable, but I’d say that’s negated by the need to install Leprechaun prior to installing the programs you want to host on it. My guess is that outside of professor decks this will be used mainly by people overreacting to the presence of Taurus. Bonus points for anyone who hosts 3 of these guys on a Djinn and then 6 programs on the Leprechauns, for a kind of inverse pyramid of programs. Probably the most interesting thing about this card is the “Source” keyword, which hopefully will be built upon throughout this cycle. Other than that, it’s a nifty effect that’s unnecessarily hindered by the neutral influence cost. If your deck relies on either Medium or Nerve Agent then this will be potentially useful, but otherwise skip it. If your deck does have some reason to want to run on R&D without accessing cards (Datasucker tokens, etc) then I suppose it does become a little easier to manage, but I still don’t think I’ll play it outside of decks using those two cards. 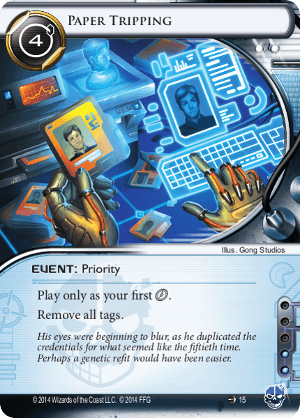 M:TG players will start dreaming of mill decks, but if that ever becomes a real thing in Netrunner I’ll be quite sad. Also worth noting, by my reading of the rules this does not prevent the Power Shutdown/Accelerated Diagnostics combo like some people are claiming. So there we have it, Upstalk. They really weren’t kidding when they said the corp comes first. The runner cards were noticibly weaker, with no obvious meta-changers popping out at me, although it did contain my favourite identity to come along in quite a while. By contrast, the corp received several knockout cards that will definitely shake the game up a bit, so hopefully the rest of the cycle won’t be as one-sided. Still, this has me excited for the Lunar cycle, and I especially want to see more plans for these “source” resources. Happy running! Love the reviews, I like that you don’t give the cards ratings (which are broadly meaningless anyway). With Eden Shard, you can prevent the Accelerated Diagnostics combo; you fire it off after the corp shuffles 3 cards back with Jackson, leaving them with 1 card in RnD and only 2 clicks. This isn’t to say they can’t still win (if they’ve brought out 3 SE and you’re tagged, you can still be double Scorched)! Thanks, Peter! 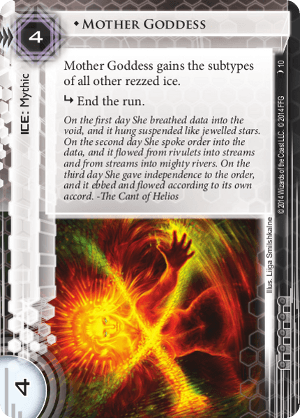 I also made a mistake with Mother Goddess in claiming she could enhance grail ice, but all fixed now. 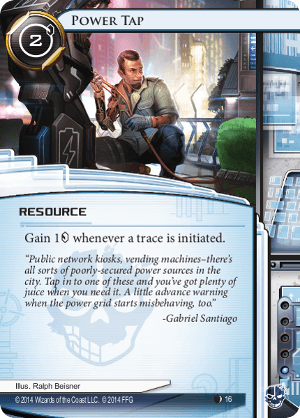 I really don’t like the idea of giving cards numerical ratings, it seems like a habit people pick up in other card games and try to apply to Netrunner without realizing how nonsensical it is. 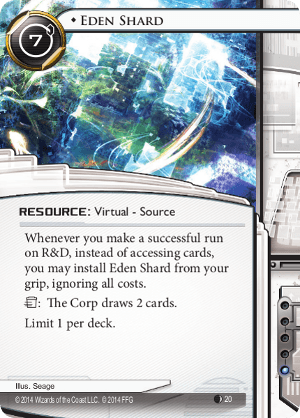 I think this was confused slightly by FFG indicating on their site in one of the data pack articles that you could use Eden Shard to deck the corp halfway through the combo, which you DEFINITELY can’t do! Yeah, I don’t know why sites give the cards rankings. It’s not like I can build a deck from all the 4 and 5 * cards and have a winning deck… Some cards will fit certain decks better! Anyway, interesting article, looking forward to your thoughts on currents when you’ve had a chance to play with them a bit.